As an individual with over twenty years’ experience in the health sector in clinical, managerial and health promotion roles, I am passionate about the role of health promotion as an approach to reduce health inequities. In addressing health inequities, health promotion is very political, as people’s health is influenced by the resources and opportunities available to them. As health promoters we need to question who is responsible for such resource allocation, how are allocation decisions made, and who has the power to allocate these resources? As health promoters we witness how the approach of health promotion is increasingly affected by neoliberalism, where neoliberal governments promote minimal government interaction with a person’s freedom to choose. The result is that some communities experience victim blaming when ‘choosing’ unhealthy health behaviours and the government’s health outcome graphs don’t improve. Such communities are identified as failing and accountable for their ill health and poor lifestyle choices. Effective health promotion places people and communities at the centre, working with communities to find their own solutions in influencing the determinants of their health and wellbeing. As health promoters we have declarations and reports such as the Ottawa Charter for Health Promotion and the WHO Commission on Social Determinants of Health that identify best practice health promotion. "..inequities in health, avoidable health inequalities, arise because of the circumstances in which people grow, live, work, and age, and the systems put in place to deal with illness. The conditions in which people live and die are, in turn, shaped by political, social, and economic forces." So while we know that empowering communities and addressing the social determinants of health is the best health promotion approach, why do governments continue to provide contracts that focus on individual behaviour change? Offering contracts with behavior related outcomes are easy to measure e.g. how many individuals attended the health day, how many individuals have lost weight or become smoke-free. 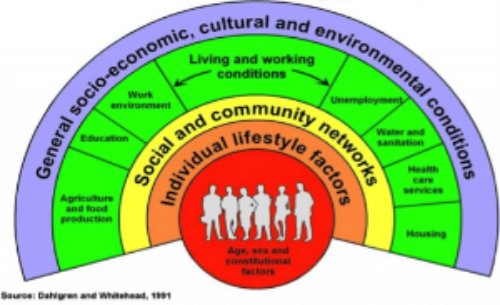 While these outcomes are laudable we know that such health outcomes and behaviour change are often unsustainable if a person’s environmental, socioeconomic and cultural settings also do not change. Short term contracts focusing on behaviour change also fit neatly into electoral terms so governments have something to report against in the hope of being re- elected for such commendable work. Committing to long term planned outcomes in partnership with the community to address the social determinants of health takes time and does not generate the same media coverage as purchasing hospital beds or employing doctors. Focusing on personal responsibility also means that governments can continue their relationships with large multinational companies such as the food industry, relationships that could be put under strain if healthy eating legislation was put in place. As health promoters wishing to address health inequities and improve the health and wellbeing of our communities we must communicate that health inequity is a moral and justice issue, and the role of governments in addressing these. We need to communicate with and involve our communities in addressing the social determinants of health that continue to influence their health and well-being. We need to strengthen the capacity of the health promotion workforce ensuring they understand their vital role in improving health locally, regionally and globally. As health promoters we have a role in providing evidence on best health promotion practice to strengthen the value of health promotion in the wider public health field and to clarity its role and ability to respond to global health challenges.